Wow, it's been way too long since I posted on here. And I just realized I'm a little late to enter into the Sketch and Stash Challenge but I used their sketch for inspiration when designing some simple invitations for my son's first birthday party. 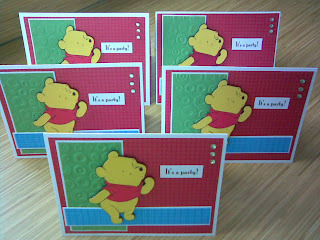 I haven't used the images from the Pooh font cartridge in any of my cards so I was excited to be able to finally use one and have Pooh be the theme for the party. We weren't going to throw a big bash in light of my FIL's situation (he'll be in the hospital for at least another two weeks) and I know he'll be very saddened that he won't be able to attend, but we decided to order in some food and have a bunch of friends and family over to help celebrate our son's big day. 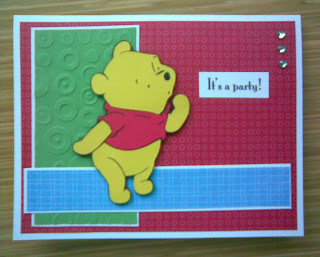 The patterned paper I used was from the Cricut Celebrations pack and the Pooh cut was at 3". It was hard to be creative and get excited about doing a boy card but now that I have a Disney Princess cart due to arrive shortly, I know I will be easily excited and eager to create invitations for my daughter's birthday. Please excuse the poor quality of the photographs. I can't find my camera so I had to use my cell phone.